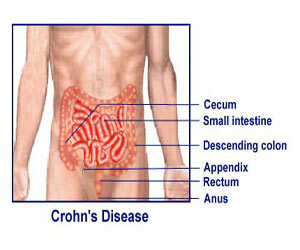 Regional enteritis is Crohn’s disease, which is an inflammatory bowel disease (IBD). Regional enteritis affects the ileum. It appears as chronic inflammation of the lining of the small and large intestine. There is inflammation of internal mucosa leading to diarrhea, dysentery and dehydration. The body’s immune system attacks the gastrointestinal tract. There is no cure for regional enteritis or Crohn’s disease. Corticosteroids may help to relieve the disease and medications such as methotrexate and thiopurine can arrest recurrence rates. Regional enteritis or Crohn’s disease is more prevalent in the developed world. Deep ulcers in the intestinal walls are instrumental for the cause of peritonitis, Crohn’s colitis, Crohn’s enteritis and terminal ileitis. Endoscopy: A colonoscopy helps in direct visualization of the ileum. It helps in identifying the pattern of disease. A biopsy may also be taken during this procedure. Radiologic tests: The barium x-ray and barium enema are used to view the image of the bowel, looking for inflammation and narrowing of the bowel. Small bowels with enteroclysis protocols are evaluated using CT and MRI scans. Blood tests: A CBC and ferritin levels explain if there is anemia, iron deficiency or B12 deficiency. ESR and C-reactive protein evaluate the amount of inflammation.